Attorney “ I am passionate about landlord rights and responsibilities. The correct application of the law is critical in protecting everyone involved in these matters. Ron started practicing law in 1971 with a local Kenosha law firm. He was a sole practitioner for 20 years before joining Rizzo & Diersen in 2002. He is experienced and widely respected in all areas of real estate law. He handles commercial and consumer collections, landlord & tenant matters, as well as a wide variety of general business issues. 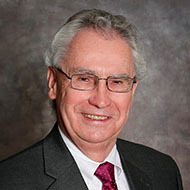 Because of his broad experience and extensive local contacts, Ron is well-known for his ability to clarify issues and settle disputes promptly and fairly. Ron enjoys following financial markets and studying various investment trends.